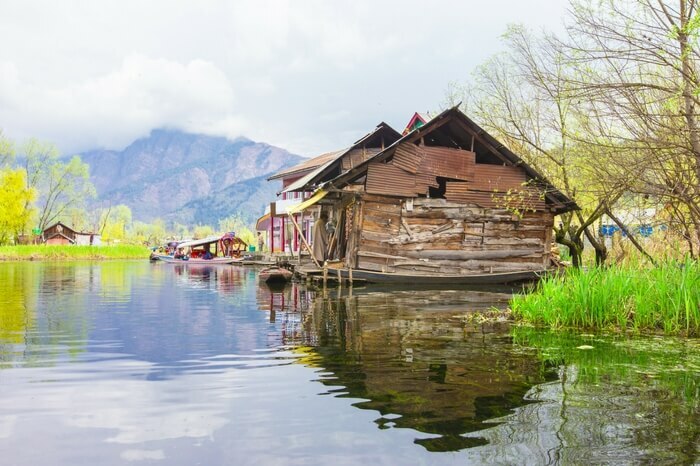 Who hasn’t heard of the poetic charm of Kashmir and its Dal Lake! 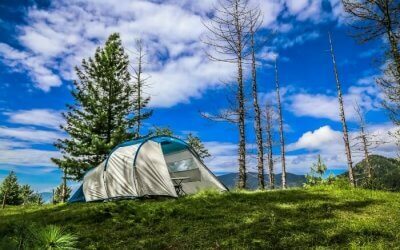 As soon as you put your foot down on the magnificent land of sparkling rivers, deep green lakes, and sleepy towns, you can feel the magic in the air. This magic remains in the air, in the waters, and in each season of this sleepy hamlet. 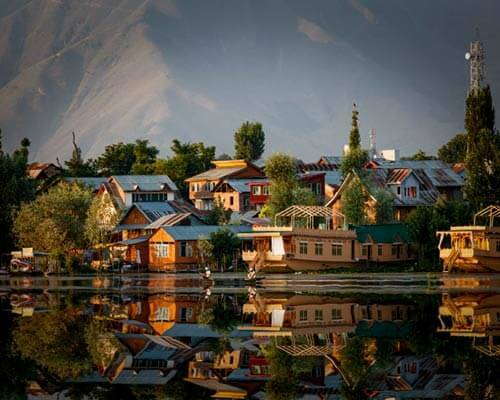 Just like there is no comparison of breathtaking views of Kashmir in autumn, Dal Lake also look spectacular in certain months of the year. 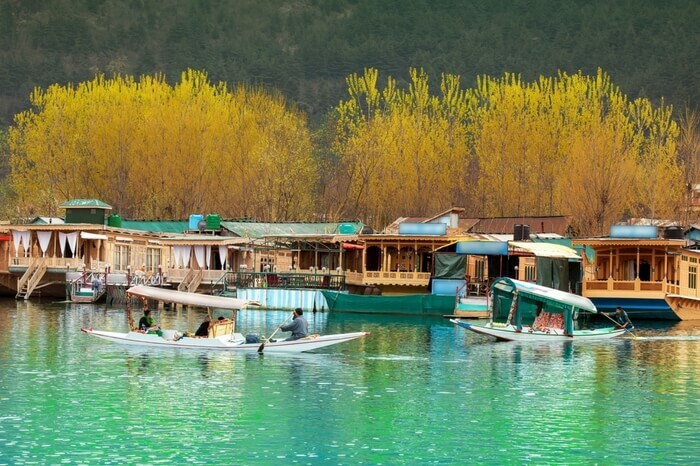 The hypnotic colors of Srinagar’s Dal Lake that change every season cannot be described in words. 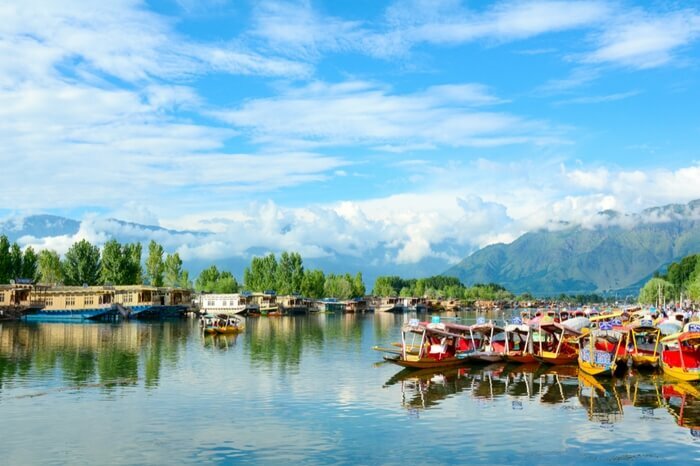 With the best pictures of Dal put together, this blog takes you on a virtual trip to experience the spellbinding beauty of Lake, even before you actually plan a Kashmir vacation. 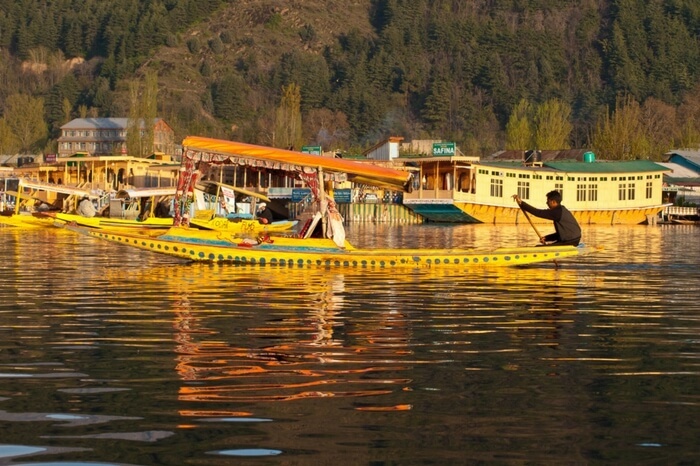 Seeing the reflection of the coloured boats on the surface of the clear water of Dal Lake while sailing in the water is undoudetdly a sight for your sore eyes. 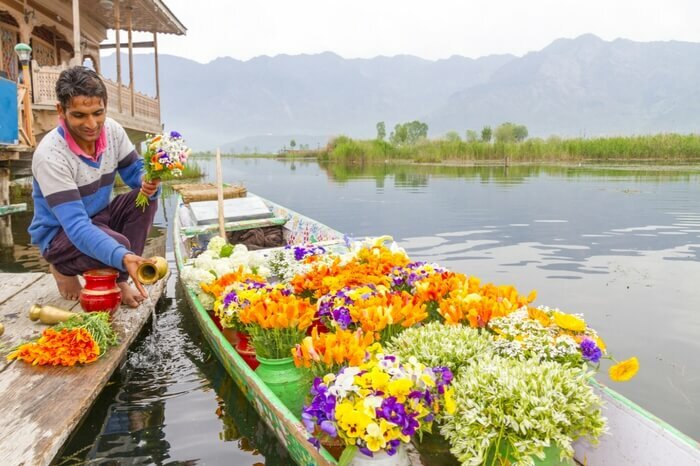 The lake comes to life as the spring splashes colourful flowers on the face of the valley. Here’s a boatman contentedly decorating his boat for the day. 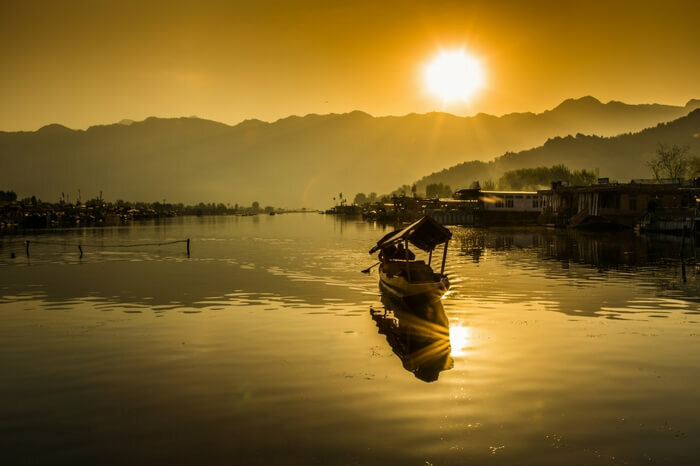 The evenings are a bit cold but you can sail as long as you want on your comfortable and snug houseboat. 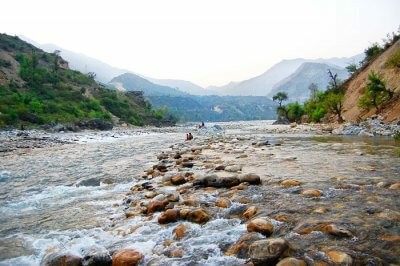 Witness the glowing sun rest behind the mountains after shining all day long. 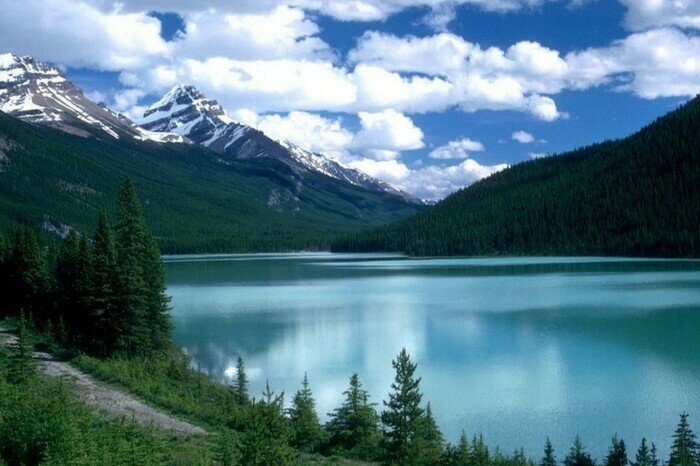 The lake looks majestic in the long hours of twilight with stardust above. 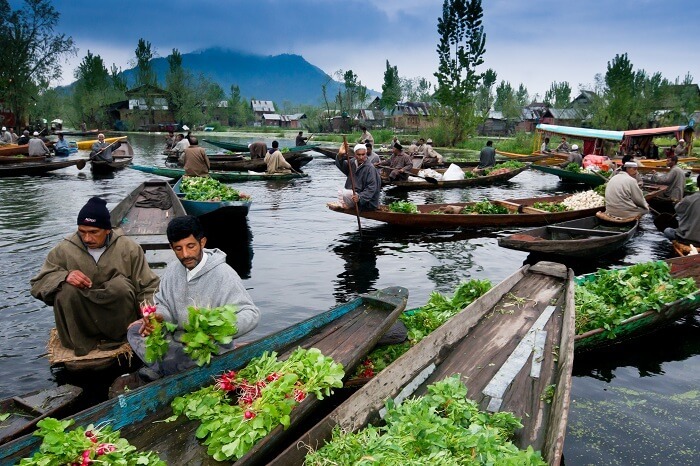 The hustle and bustle of the floating bazaar is delightful. 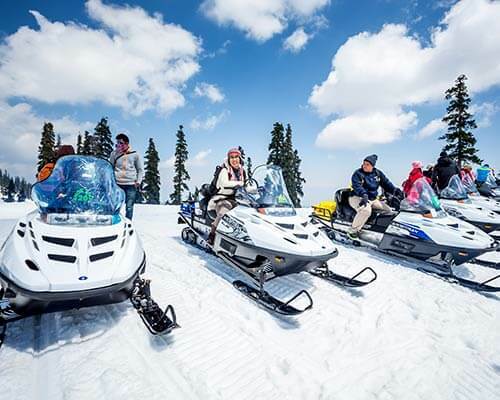 Summer brings infinite fun for tourists and a lot of business for the dwellers. 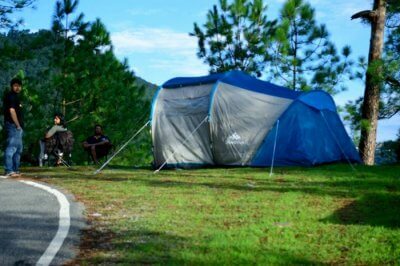 The town is greener than ever making it a perfect hideaway for couples and families alike. When the days get warmer, the skies get clearer. 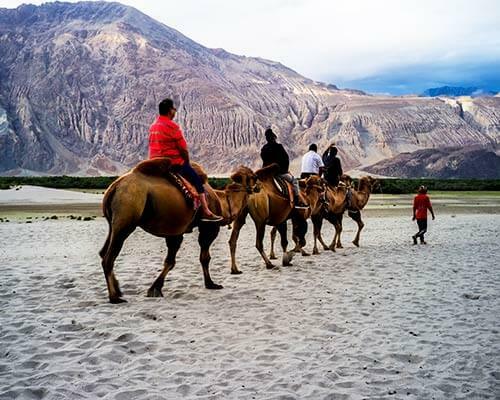 You can clearly see the mountains wrapped in green velvet-like grass meeting the wide blue skies. 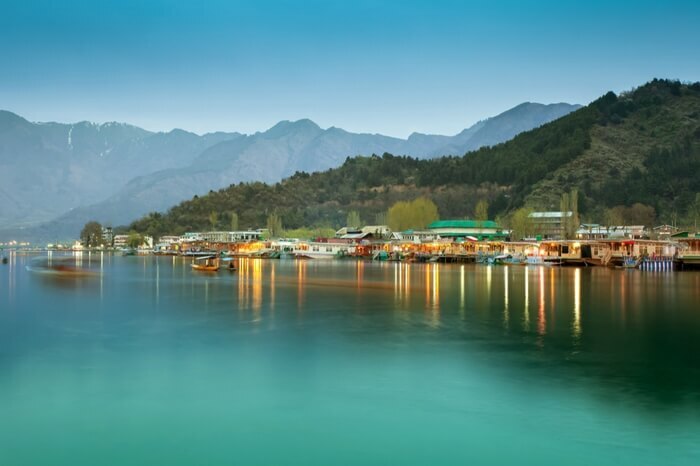 The gardens and forests around Dal lake are decorated with fresh, green leaves and flowers making the lake look ever more majestic. 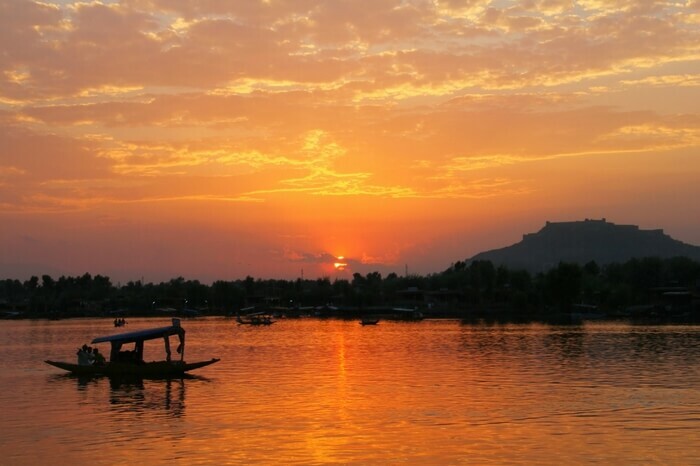 Spending your evenings sailing on Dal Lake while watching the dramatic silhouette against the dimming sky. The water of the lake and the sky go all orange making it a picture perfect sight. The Autumn makes the sun go mild and brings a chilly mist into the air. 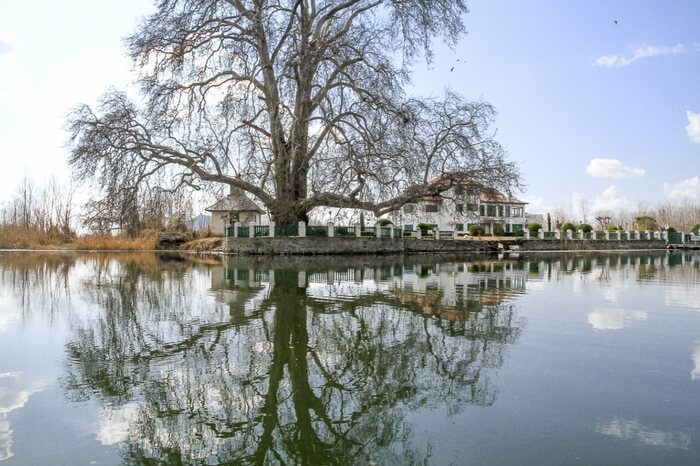 Walking on the land, you can’t miss the rustling sound of fallen Chinar leaves. 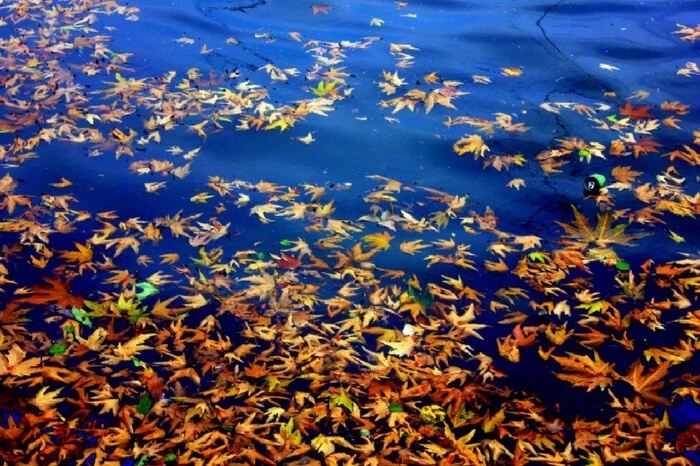 The shedding of Chinar leaves mark the onset of Autumn bringing a beautiful change in the valley and around. The colour of the town begins to change with each passing day. The golden, crisp leaves fall on the ground from almost bare trees. 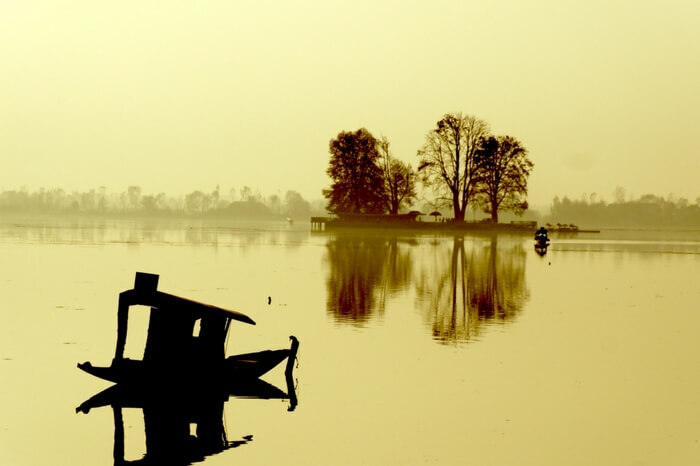 The Chinar trees around Dal lake start shedding their leaves on the surface of lake water. The harvest days end with this. 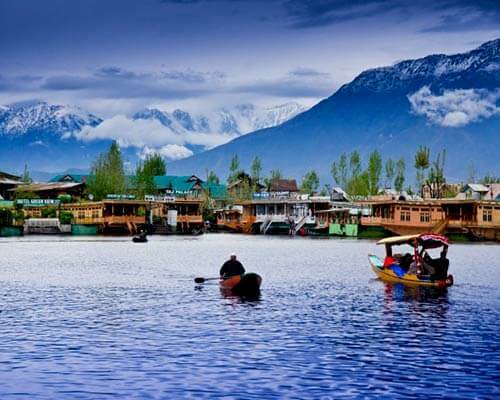 Must Read: Autumn Affair In Jammu & Kashmir: A Burst Of Colours! 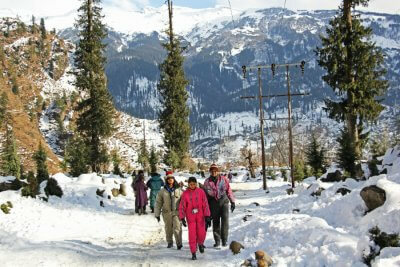 The town is covered with snow and becomes a visual treat to eyes. Every blade of grass, every fallen leaf, and every intricacy of twig, is clad with snow. 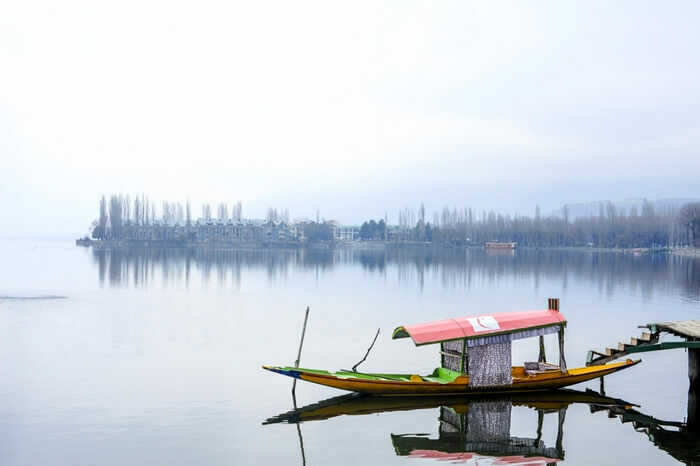 It’s an incredible experience to be on a boat as the soft snowflakes silently fall on the partially frozen Dal Lake. 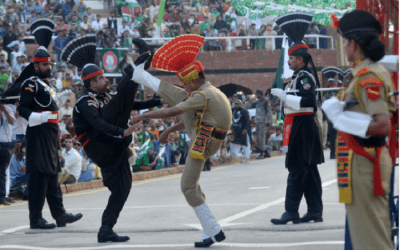 A different Kasmir comes to life as the snowflakes touch the ground. 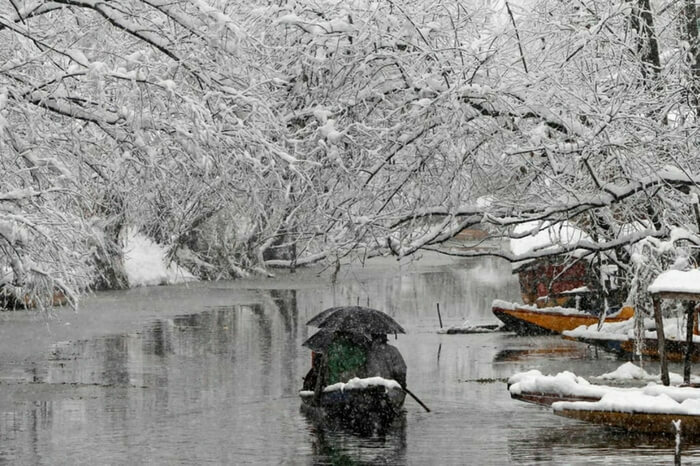 Leave behind the noisy city streets to watch the freezing Dal Lake. 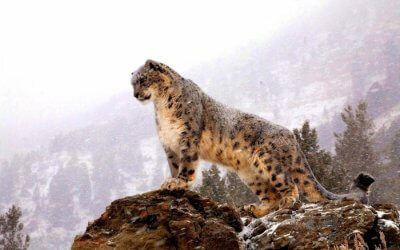 The deep blue sky is covered with a thick layer of mist during Winter. 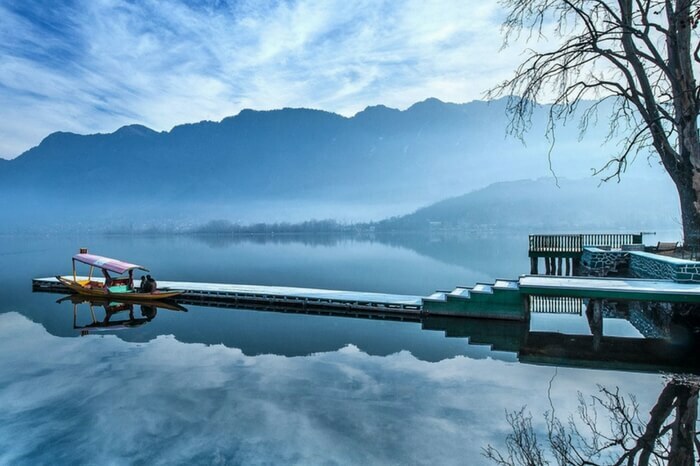 The town becomes intensely silent and the lake almost abandoned. 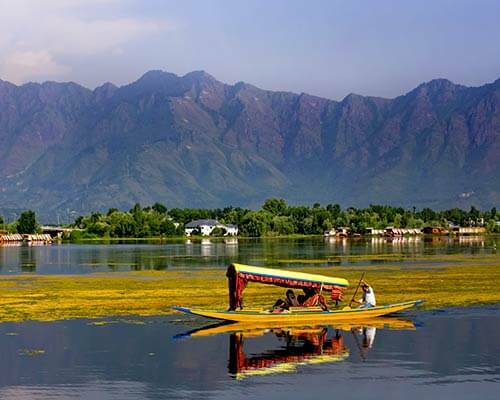 It’s the best time to visit Dal Lake for those who crave for ultimate peace.